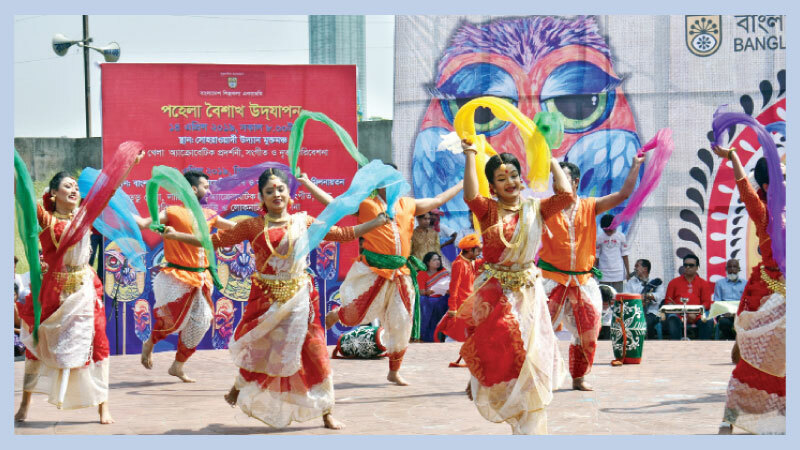 Bangladesh Shilpakala Academy (BSA) welcomed the Bangla New Year 1426 through elaborate programmes at two separate venues of the capital on Sunday (April 14). The programme began on the open stage of Suhrawardy Udyan in the morning with a group dance performance, led by Deepa Khandakar, with the song ‘Esho He Baikhakh’. Later, artistes of BSA performed dance with the songs ‘Mongol Hok Ei Shotoke’ and ‘Dole Nagor Dole’. At the event, singer Shirin Akter, Arif Chowdhury, Sardar Hirok Raja, Ruksana Rupsa, Sharmin Ahmed Nupur, Moushumi, Shopna Paal, Samir Baul, Sharif Sadhu and others rendered music. The programme also featured acrobatic show and ‘lathi khela’. The second part of the programme held on the open premises of BSA in the evening. The programme began with the group dance performance, led by Ripon, with the song ‘Esho He Baishakh’. Later, there was a display of ‘lathi khela’ by Bir Shreshtho Noor Mohammad Lathiyal Dol from Narail district, Ha-du-du khela by Narayangonj based troupe and acrobatic show by the artistes of BSA. Besides, artistes of the BSA and Bangladesh Academy of Fine Arts performed group dances. The artistes, led by Farhana Chowdhury Baby, Warda Rehab and M R Wasek, performed group dances. The programme also featured solo music rendition by singers Zafor Ahmed, Nazia Bristy, Upoma, Bornali Sarkar, Ibne Khaledun Rajon, Suchitra Sutradhar, Antara Rahman, Al Amin, Beauty, Komalika, Uday Bandyopadhyay and Shahnaz Rahman Sumi, poetry recitation by Daliha Ahmed and Jayanto Chattopadhyay.